Crawl space humidity has been plaguing homes in British Columbia since the first day they were built. We offer free crawl space repair quotes in Kelowna, Vernon, Kamloops and many areas nearby. To schedule your free appointment, call or e-mail us today! As humidity builds in your crawl space, it creates an ideal space for mould and rot to grow. As it does, all organic material in your crawl space will be damaged -- including wooden floorboards and support beams. additionally, many pests (termites, carpenter ants, wood-eating beetles, crickets, et al.) love rotting, mouldy wood. Your open vents will be an invitation for them to move in. As the mould and rot increase, and animals begin to live (and die) in your crawl space, odors will begin to rise into your home along with the crawl space air. Mould spores are a known allergen, and they can significantly affect anyone in the home who suffers from asthma or allergies. Fortunately, controlling crawl space humidity is easy! At BC Basement Systems, a crew of our crawl space contractors can usually install a moisture control system in less than a day. At BC Basement Systems, crawl space repair is our speciality, and we'd like to show you why we're the best. To help you decide which repairs are best for you, we offer free crawl space repair quotes to homeowners in our area. 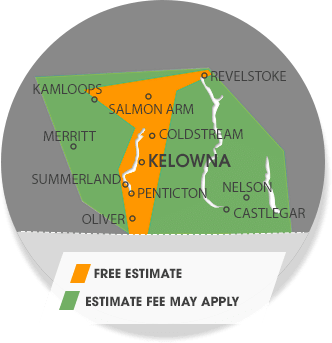 We serve British Columbia, including Vernon, Kamloops, Kelowna, Nelson, Quesnel, Penticton, West Kelowna, Salmon Arm, Castlegar, Williams Lake, Trail, Coldstream, Winfield, Westbank, Armstrong, Chase, Oyama and many areas nearby. To schedule your free quote, contact us today!